A lot has changed since I took this photograph. The artist Barry Flanagan died in 2009. O’Connell street has been a building site for many years. The 124 year old Fr Mathew statue needs a new home due to new tram system. LUAS trams will be running through O’Connell Street tomorrow. 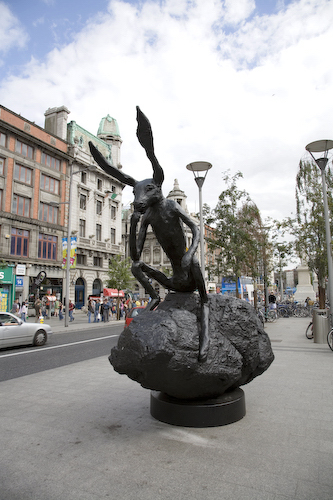 Back in May 2006 six giant bronze Hare sculptures, by one of the world’s most renowned sculptors, Barry Flanagan, were installed on O’Connell Street for one of the most exciting, eye-catching exhibitions ever seen in the Capital [actually there were eight Hares, an elephant and a pair of cougars]. The purpose of the the exhibition was in part to celebrate the refurbishment of O’Connell Street which was due to be completed by 27th June. I am willing to bet that most of you have forgotten that the street had been refurbished because the place has been a massive building site for the last four or five years however the good news is that we should get the street back in the near future because the first ‘test’ trams are due to begin running tomorrow at 4am and continue for the day.